It was inside Britain’s most haunted prison. 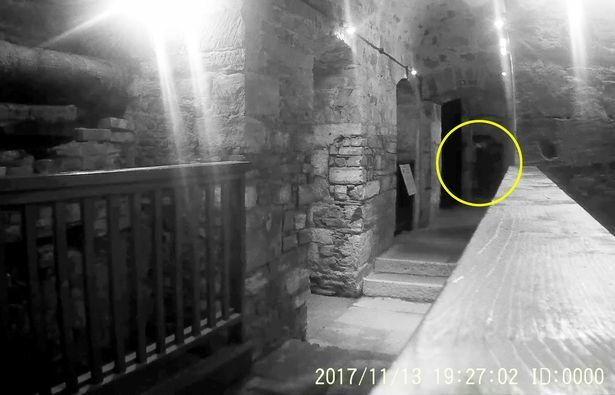 The eerie apparition was caught on camera by Tony Ferguson at Bodmin Jail . He decided to visit the notorious Cornish prison, along with his wife Bev, as it is the site where some of the country’s worst criminals were executed. After making sure they were the only visitors in the famous attraction, the couple say they captured many supernatural incidents. These included faintvoices, strange electronic voice phenomena and light orbs flying around the rooms. But Tony, who lives in Southampton, said its spookiest moment was when the lights went completely white before what appears to be the full figure of a ghost turned up in an empty corridor. The 32-year-old believes the ‘apparition’ caught might be that of William Hampton, the last man to be hanged in the county as he called his name a few seconds before the apparition appeared. Tony said: “We had scratches, banging, EVPs, strange noises, shadows, mists, strong orbs and best of all a ghost. “Bodmin [Jail] have verified this, also have they have seen this ghost and were shocked at some of the captures”. They got engaged in 1908 but, a few months later, after Emily is thought to have said she would not stay with William anymore, he killed her in her family house.The murderer gave himself up to the police after running away from the scene. He was executed on July 20, 1909 and became Cornwall’s last person to be hanged.In all, between 1735 when the jail opened and 1909, 60 people, including eight women, were executed in Bodmin Jail. It fully shut in the early 20th century and the buildings were sold in 1929.